Colin Thompson's book, The Paradise Garden, is about a little boy named Peter who is driven crazy by the urban noise all around him. "Only in one place was there any peace. In the west of the city was a fabulous garden. There, behind its tall walls and thick trees, it was possible to escape the noise. For Peter, who had lived all his life in narrow streets, it was the closest place to paradise he had ever seen." Peter decides to live in the park one summer but as summers will, that one came to a close and by autumn, Peter was lonely and he knew that it was time to go home. 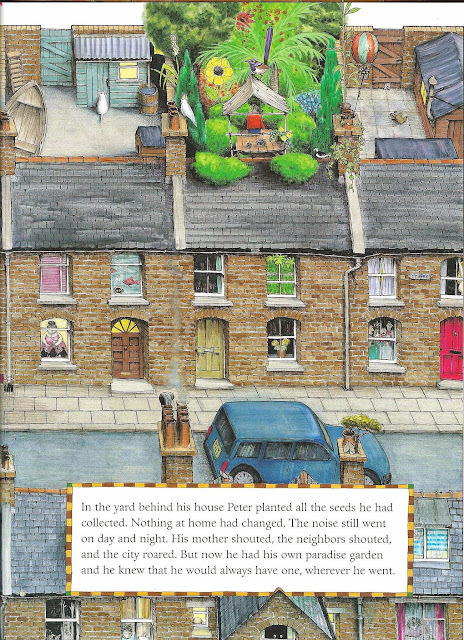 The story ends with Peter planting his own paradise garden in his back yard. On the first day of the garden bloggers fling in San Francisco, our bus drove a short distance from our hotel (10 minutes) and stopped in front of an apartment building. Street, sidewalk, building edifice with no sign of green anywhere. Here's a picture from google maps. Were we stopping to pick up a late arrival? Flat tire? No on both counts. We followed instructions to get off the bus and follow our leader. We dutifully folowed through a convolution of stairs and corridors which seemed to get smaller and darker as we went. There was one glimpse of daylight. We were all a little relieved to find at the other end a garden, not just any garden, but a paradise garden in a courtyard created by the arrangement of several older apartment buildings, just like the one in Thompson's book. This magical place is the creation and home garden of Organic Mechanics James Pettigrew and Sean Stout. A used votive candle holder, found in a church by OM sits on the left of the door at the end of the hall. I already know that this will be my kind of garden! You'll see many images of this fabulous walk on the blogs of fling attendees as it was a big hit with the group and it's way cool! Beautiful high brick walls enclose the garden giving it a sense of security and sanctuary from the bustle of the outside world. There are many wonderful plants and objects to be discovered in this garden. I've a feeling that we could spend several days here and we'd still be finding treasure. A sunny spot is home to an interesting collection of drought tolerant plants. So much to love in this garden. I'm thinking that a mantle like this might rot in my garden. I'll have to find one and see! The plants were all so fabulous. The fragrance of the brushed foliage of this tagetes (yup, that tall yellow flowered thing is a marigold which is hardy here) is a delight. Looking back toward the door to the left through which we originally came. Makes you wonder what they'll pull of their hat next. The bunny on the left is embarrassed by my bad attempt at humor. So many reasons to adore this garden! I wonder what Vicki's husband will think of her "singing duets" with a 25 year old named Simon? Oh well, what happens at the fling stays at the fling, right? Here are our hosts, the Organic Mechanics themselves, Sean Stout and James Pettigrew. I felt the same way, lucky and happy with this garden alone. To all of our delights, there were many more equally wonderful garden tours to follow! I wish I could have come to SF..I grow up in the East Bay and lived for a while in SF. Didn't take a blind bit of notice to anything green. It would have been great to have you there! I'd no idea that you grew up in that area - how lucky for you but also sad that you weren't interested in plants then as it's a horticultural paradise! My reaction to this garden was much the same as yours. What a gem. A true oasis. Your pictures are wonderful and a great reminder of a special time. It's a pleasure to see everyone else's posts about the fling gardens for the similarities and differences in what we noticed, liked, etc. and as you said they are great reminders of a special time! Glad that you liked this garden too! I loved this garden too, it was so fabulous. You got some wonderful pictures too. And I loved the opening references to a book about a little boy named Peter. I would love to have a walkway like theirs in my own garden, but don't have a clue how to go about it. Also, thanks for the advice about how to deal with my Hypericum. I didn't realize it was rust. I'll try cutting it back and cleaning it up thoroughly and see what happens. Glad you liked the garden and the post. As for the walkway, first, I imagine that we'd need to start collecting cool stuff that would work in a pathway like that. Bedrock is a great source for broken pavers as are headstone places. Jones glass and used materials in Tacoma used to be a good source for unusual stuff. It's still there but I've not been back in a while. Perhaps we should go junking some day? That hypericum has been fairly susceptible to rust for me so that's the only reason I knew anything about it. 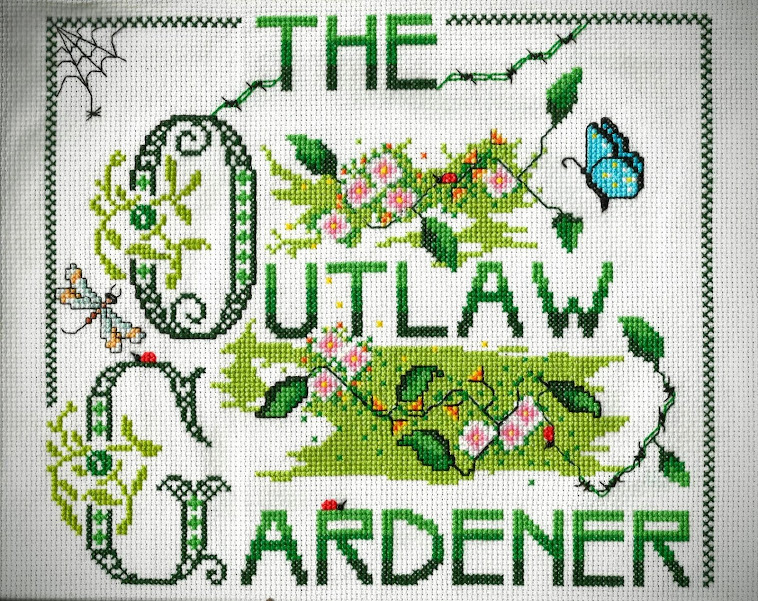 I think this is my favorite write up so far on this garden. What a wonderful space! Thanks Heather! This was an amazing space and reminded me a little of the Tales of the City books for some reason. This is the best post on this garden yet! Of course I totally loved your intro, what a great story. I'm really enjoying seeing everyone's Fling posts, it's like reliving the tours all over again. Aw, gosh, thanks Loree. I'm sure there will be many even better ones to come. I agree, seeing everyone else's posts keeps the memory fresh. Glad that some posts will come later to help lengthen the enjoyment! I can't wait to see your post about this garden! It was a great place as were all of the gardens we were lucky enough to visit! What a fun time even if we roasted a little! Wonderful intro to the post on an amazing city garden. The mystery walk was pretty good too since I found it a bit creepy even though I knew where you were going from Alison's post. With all the treasures in this one garden it will be fun to see how many the other bloggers found as well. It would be fun to see you and Alison junking for a day. I've been collecting stuff for a path, it takes a while. Can't wait to see the rest of your SF posts. Glad you liked the post! This was a great place and I know I missed a lot but it was a treat to be there! I've been collecting stuff too including a manhole cover left by the previous owners of the house. I think it's still up in the attic. I love doing the SF posts because they bring back such fond memories. Such an extraordinary garden. Not quite my type, but it looks great. It's wonderful that there are as many different gardens as gardeners and they all look great! It's so true! Each garden has a personality and life of its own and each is wonderful is its own way! Happy weekend Satu! It's so fun seeing everyone's take on these gardens...so interesting to see things you noticed that I totally didn't catch! I agree! Interesting where other eyes focused when looking at these gardens! Indeed! The path is pretty darned special! Note to self - start collecting stuff now! If I lived in an apartment building, this is the kind of garden I would love to have in the courtyard. It's interesting that lots of people were drawn to take pictures of that clock and the votive candle holder. There was something interesting about the play of time and ideas in that garden and those two objects seem to sum that feeling up most clearly. You mentioned in your post something about time standing still in that garden. The votive holder is there but has no glass candle holders in it. Is it for our own thoughts to ignite the flame of inspiration? Icons from several cultures, the head, broken on top - an open mind perhaps. The path - interesting reuse of discarded objects or the piecing together of something beautiful from the trash that life sometimes throws at us. While this garden may just be an interesting assemblage of objects and plants, one could also read a lot of meaning into the various pieces. This is the magic of art for me that the artist sends out a statement, a feeling, longing, whatever and it can be interpreted and enjoyed in as many ways as there are observers. Ain't it grand! Glad you liked this garden! Your boyfriend's niece might also like the book Dangerously Ever After. Lots of imagination at play here. I've been seeing quite a few paths and patios lately that are put together like a patchwork, but this one even has a jigsaw puzzle piece incorporated into the design. This garden was lots of fun! I just love your perspective on this incredible garden! Wish I'd had a chance to talk with you more. Next time, for sure! Thanks Linda! This was my first fling and it was marvelous meeting so many great garden bloggers like yourself and seeing so many incredible gardens. With so much sensory stimulation, it was difficult to focus on anything or anyone for very long! I look forward to seeing you next year in Portland! A Day in Portland Part Two: Name That Garden! Exciting Developments in the Outlaw Garden.